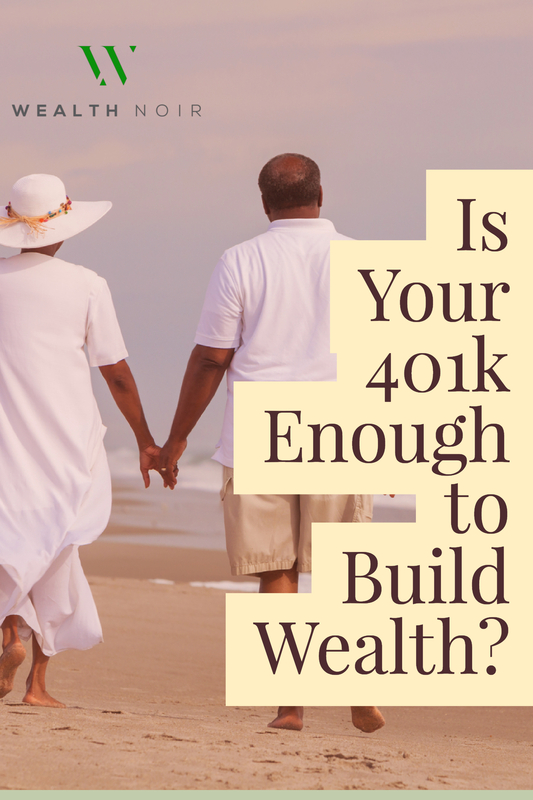 Is Your 401k Enough to Build Wealth? This is a guest post by Brenton Harrison who has come to share her knowledge with the Wealth Noir Community. If you are interested in writing a guest post, reach out and contact us. There is a savings crisis in our country. Incomes haven’t increased significantly over the years, while the costs of housing, healthcare, and even consumer spending have risen considerably. By some estimates, if you’ve been able to save $10,000 you’re already in the top 25% of Americans. With these numbers, you would think that all other aspects of our finances are in trouble too. But there’s one area that flies in the face of this conventional wisdom. There is one type of account whose average balance has continued to increase, and in 2017 it hit the highest average balance in history: the 401(k). In 2017, a study analyzing over 15 million 401(k) accounts found an average balance of $97,700! Before we dig into how this is even possible, it should be clear that if emergency savings are dwindling but 401(k)s are increasing, we might be a little out of balance. It’s not uncommon for the 401(k) to be the only place investors have any invested assets. Ease of getting started: There are endless options for people to invest in today’s economy. Individual Retirement Accounts, gold, and precious metals, bitcoin, angel investing: you name it and there’s a way to buy it. But of all the options available to you, I would argue that the 401(k) has become the most seamless account to start. As a matter of fact, it’s possible to start a 401(k) without doing anything at all! Lack of investment knowledge: A 401(k) is a type of retirement account, not an investment. Investments are what your money is contributed towards once it’s deposited into your 401(k). This difference is important, as employees often have more help in choosing the investments inside their 401(k) than they would by opening an account outside of work. In recent years, companies have relied increasingly on target-date funds, which allow employees to choose investments based on the year closest to their retirement date. For an employee who wants to retire in 2055 and chooses a target date fund close to that year, it will likely start off investing aggressively and become more conservative the closer they are to their target date. Many of us can feel intimidated by the prospect of researching investments when there is no hand to guide you, making the relative ease of decision-making an attractive feature of 401(k)s.
Employee matches and tax deductions: Any investment account where you not only have the ability to receive free money from your employer through matching AND potentially lower your tax burden is bound to be popular. A 2012 study by Fidelity observed the habits of employees with at least $1 million in their 401(k)s and found that on average, 28% of their money came from an employer match. In case you’re not the best at math that means they’re in possession of at least $280,000 in free money. And for traditional retirement accounts, the immediate tax benefits can be hard to turn away from, as money contributed towards traditional 401(k)s can reduce your taxable income. Liquidity: 401(k)s are tax-deferred, meaning you don’t owe taxes on things like the interest and dividends the investment generates until you withdraw the money. In exchange for tax deferral, you can’t withdraw the money any time you want. With some exceptions, 401(k)s don’t allow withdrawals without penalty until age 59 ½, meaning liquidity is definitely not one of its strong suits. The lack of liquidity can be problematic for people who haven’t established adequate savings, as any emergency might force them to borrow money on credit cards or through 401(k) loans, or take early withdrawals, which would subject you to penalties and income taxes. Even if you need cash for positive reasons, such as purchasing investment real estate or starting a business, having the overwhelming majority of your assets in an account that can’t be accessed until you’re almost 60 won’t help much. Investors should have a focus on establishing both emergency funds and investable assets outside of retirement that can be accessed when needed. Legacy: While it’s possible that your heirs could live well off of your retirement funds, traditional 401(k)s have limited effectiveness as a tool for generational wealth. These accounts do allow you to avoid paying income taxes on your contributions. But the government is going to make sure that money is taxed at some point. To ensure this happens, they created Required Minimum Distributions or RMDs. At age 70 1/2, whether you need the money or not, the IRS starts making investors take yearly withdrawals from their traditional 401(k)s using a formula that takes into account your projected life expectancy. While there are calculators available that break down the formula and estimate the impact RMDs could have on your retirement accounts, the impact of RMDs on your retirement accounts can be hard to project ahead of time. Each year the percentage of the required distribution increases, and if you live a long time in retirement it’s possible that the amount you must withdraw becomes harder and harder to replace with your investments. Even if you die early in retirement and pass your accounts to your beneficiaries, they will still have to take RMDs based upon the age you would have been if still alive. So now that you know a few of the areas left uncovered by 401(k)s, what are some of the other investments you can use to supplement your portfolio? What tools can be used to establish balance, increase liquidity, and give you access to a more diverse grouping of investments? Emergency Savings: It may not be the sexiest part of your plan, but having adequate insurance and savings is the first step in building a portfolio. Single investors should aim for 6 months’ expenses in savings to cover unexpected expenses and/or loss of income, as well as disability insurance that replaces income in the event of an illness or injury. Business owners, contractors, and employees who are heavily dependent on commissions, bonuses, and even overtime hours should be especially vigilant when securing coverage, as they may have no coverage or work coverage that doesn’t adequately protect their income. Couples should not only consider savings and disability insurance, but also life insurance to cover their respective contributions to the budget in the event of a death. If you’re interested in investments such as real estate or you own your own business, you might consider keeping an even larger amount in savings to cover any periods where you don’t have tenants or experience a decrease in cash flow. Mutual funds and brokerage accounts: When you invest in a mutual fund, you’re investing in a basket of securities that could include stocks, bonds and more. While you can have mutual funds inside your 401(k), investing in them outside of retirement accounts allows you to establish funds that you have access to before age 59 ½. There are times when it’s appropriate to pay a fee to have investments managed, but people who are starting out might want to look into no-load or index funds. No-load funds are funds that don’t force you to pay a commission or sales charge to purchase them, while index funds are funds that limit their internal costs by simply tracking a certain portion or index of the market, such as the S&P 500. Exchange-traded funds, or ETFs, offer another low-cost alternative to investors. ETFs hold a pool of different types of securities, and the operating expenses for ETFs are often attractive when compared to many mutual funds. Both of these methods are excellent ways for people starting out to establish funds while limiting expenses. While you can buy into these funds directly with different companies, some people who are looking to invest in multiple funds or even stocks and other investments can sometimes benefit from opening a brokerage account, which allows you to keep all of these holdings within one account and can be linked to your checking or savings to make it easier to deposit or withdraw funds. Some popular financial service companies such as E*Trade, Fidelity, Scottrade or others, offer educational materials for investors to do their own research in addition to offering the ability to open brokerage accounts. For a complete list of firms please consult your financial professional. Before investing in any mutual fund, please carefully consider the investment objectives, risks, charges, and expenses. Roth IRA: Investors who are eligible for Roth IRAs should consider utilizing them in addition to traditional or even Roth 401(k)s. Unlike 401(k)s, which could be subject to penalties if you take a loan for money accessed before retirement age, Roth IRAs actually allow their owners to withdraw funds without penalty before 59 ½ in certain circumstances. If you’ve had your Roth IRA open for a minimum of 5 years, you can withdraw any contributions made to the account free from penalty or income tax. While we don’t recommend tapping into your retirement account too soon, this feature does give Roth IRAs more liquidity when compared to 401(k)s.
Real Estate: As the years progress, real estate is offering more and more ways for people to invest. Want to establish a consistent flow of income? You might consider looking for opportunities to buy an investment property. Even if you don’t want to be a landlord, services like Airbnb and VRBO are allowing people to turn even a spare room into a surprising investment. There are no guarantees in the stock market or in real estate, but having a mix of the two can put you in a position where your financial stability is not wholly dependent on one form of investing. These are just a few of the options available to those who have established a firm financial foundation. To be clear, a 401(k) is certainly a great tool, and the fact that you’re putting any money aside is something to be proud of. We’re here to help make sure you not only save but ensure that where you’re saving makes sense within your overall financial plan. We encourage you to sit down and think about your goals both short and long-term, and plan out your portfolio so that it takes advantage of both your retirement options and also those available to you outside of retirement as well. 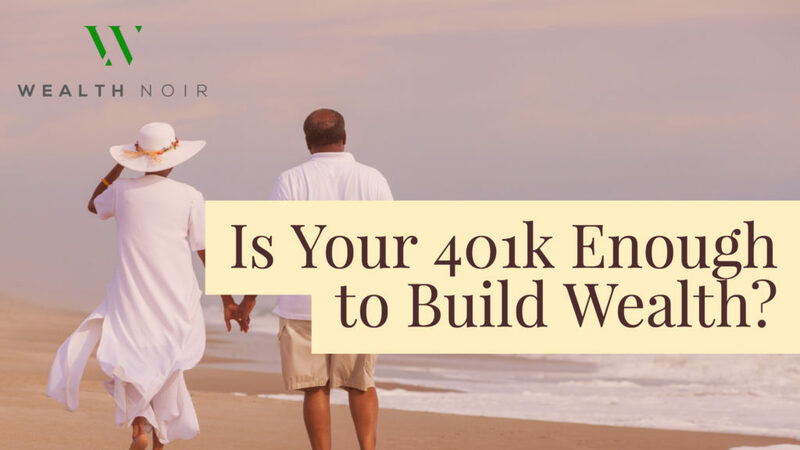 You can definitely build wealth with just a 401k, but there are caps on how much you can contribute to a 401k. So if you have a fat salary, let’s say $500,000 a year, you will be limited in how much you can dedicate to investing if you only use a 401k. You would also leave yourself exposed with no emergency savings and miss out on other more lucrative investments, such as real estate.